Our professional concrete driveway staining in Long Beach CA can make your driveway a work of art. When someone drives up to your home or business, the driveway is one of the first things they see. A long expanse of plain white concrete can be boring or even an eyesore if it doesn’t complement the overall design of your property.concrete driveway staining in Long Beach CA offers almost limitless possibilities for making your driveway serve your architectural design, rather than detracting from it. 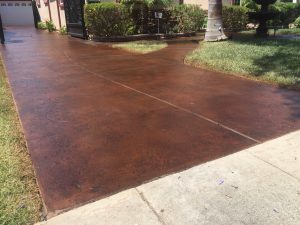 Beautiful: Whereas paint would give you a flat color, concrete driveway staining in Long Beach CA penetrates into the concrete to create rich, deep, dimensional color. We use water-based stains to give you a full spectrum of hues to choose from. By combining or layering stains, you can create a variegated look that will add even more interest to your driveway. Quick: Most of the time, making a dramatic impact on the appearance of your home or business is a major undertaking lasting weeks or months. From start to finish, concrete driveway staining in Long Beach CA usually takes just two days. It might take longer if you have an especially large expanse of concrete to stain. Cost-Effective: Concrete driveway staining in Long Beach CA is a particularly good investment when you’re dealing with an old, discolored driveway. With the right combination of stains, you can cover many types of imperfections at a fraction of the cost of pouring new concrete. You can also create the look of expensive materials like stone or tile without breaking your budget. Concrete driveway staining in Long Beach CA isn’t as easy as you might think. It takes skill and experience to get every step right, which is why you need to hire a professional.Fuller Concrete Staining specializes in transforming driveways with stain, and we’ve mastered all the best techniques for this process. We’re so confident in the quality of our work that we offer a 100 percent satisfaction guarantee.